Toyota Motor Corporation President Akio Toyoda broke his silence on company's staggering safety woes, apologizing and vowing to improve quality during a Friday press conference. It can take decades to build a reputation and just months to watch it collapse. Just ask Toyota President Akio Toyoda, who found himself sitting in the hot seat Wednesday, facing skeptical members of the House Oversight and Government Reform Committee. Barely a year ago, when the executive was appointed to run the company his grandfather founded, the Japanese automotive giant seemed to be on top of the world. True, it was running a rare loss, losing more than $4 billion in its latest fiscal year, but it had just nudged past its long-time archrival, General Motors, to become the world’s largest automaker. The cornerstones of that growth were safety, quality and reliability. In the United States, Toyota’s largest market, the maker also scored points with its aggressive expansion of facilities. With billions invested in North American assembly, design and engineering operations that employ tens of thousands, Toyota has taken pains to promote itself as much an American company as its competitors in Detroit. But the hearings on Capitol Hill have torn asunder Toyota’s carefully cultivated image, leaving observers to wonder whether it was ever more than a Potemkin village. 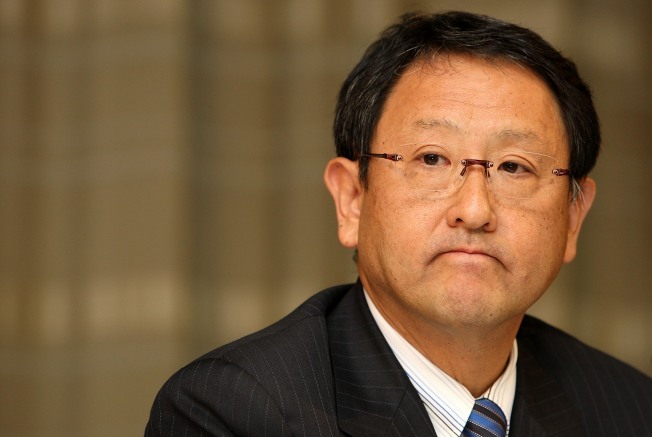 In prepared remarks, CEO Toyoda, 53, conceded to the committee, "We pursued growth over the speed at which we were able to develop our people and our organization," adding that, "I regret that this has resulted in the safety issues described in the recalls we face today, and I am deeply sorry for any accidents that Toyota drivers have experienced." The humble tone is one that both Toyoda and Toyota have sounded repeatedly in recent months, starting with last October’s recall of 3.8 million cars, crossovers and trucks for problems with “carpet entrapment.” Things got worse in January, when millions more vehicles were recalled due to potentially sticky accelerators. In recent weeks the situation has spun seemingly out of control, with still more recalls and investigations launched for matters ranging from faulty steering to intermittent brakes. Toyota has tried to balance its corporate mea culpa with pledges — aired on TV and in full-page newspaper ads — aimed at convincing consumers it has the situation under control. Yes, there are problems, but Toyota officials know how to fix them. But that spin lost momentum in two tough days of testimony on Capitol Hill. Members of Congress initially were polite, praising Toyoda for agreeing to step into a lion's den. But he and a top deputy drew heavy fire from both Democrats and Republicans for the company's slowness in dealing with safety defects in its vehicles. "I sincerely regret that some people actually encountered accidents in their vehicles," said Toyoda, who gave his opening remarks in heavily accented English but chose to respond to questions in Japanese with a translator. Toyoda pledged his company would change the way it handles consumer complaints, including seeking greater input from drivers and outside safety experts when considering recalls. Toyota managers will also drive cars under investigation to experience potential problems first hand, he said. A previous hearing Tuesday before a House Energy and Commerce panel did not go well for the company. Jim Lentz, Toyota’s top U.S. executive, declared he was confident “the solutions we have developed are both effective and durable.” He went on to dismiss critics who contend faulty electronic control systems might be at the root of some problems on Toyota vehicles. Both assertions now seem questionable. In his testimony Lentz eventually conceded that as many as 70 percent of the complaints over so-called “unintended acceleration” are not necessarily covered by the two related recalls now under way. Making matters worse, lawmakers heard testimony from David W. Gilbert, a professor of automotive technology at Southern Illinois University, who countered Toyota’s long-standing assertion that its electronics are well-designed and well-tested. Gilbert said testing showed that Toyota's electronic throttle control could malfunction which, in turn, could lead to unintended acceleration. At least one member of the panel raised questions about the testing because it was partly funded by attorneys who are involved in litigation against Toyota. By the end of the first day of hearings, Lentz’s own confidence in Toyota’s ability to identify and fix the problems with its vehicles seemed to have been shaken, as seen in this exchange between Lentz and Rep. Henry Waxman, D-Calif.
WAXMAN: Do you believe that the recall on the ... carpet changes and the recall on the sticky pedal will solve the problem of sudden, unintended acceleration? WAXMAN: OK, what do you need to do? LENTZ: We need to continue to be vigilant and continue to investigate all of the complaints that we get from consumers, that we have done a relatively poor job of doing in the past. Lentz also said he was "embarrassed" to hear testimony from a driver who said her nearly new Lexus ES350 suddenly accelerated up to 100 mph in 2006 before she was able to bring it under control. One can only wonder where that leaves the millions of people driving Camry sedans, Tundra pickups and Prius hybrids. Perhaps feeling a bit snookered by a well-oiled machine that made plenty of promises during the good times but which now appears to be imploding. Consider the way Toyota has been billing itself as an “American” company, in recent years, devoting a fair chunk of its marketing budget to talk about its U.S. plants and people. The problem is that the company has been exposed as more of a modern-day trading post, doing business with the native population. The hearings have revealed that virtually all key decisions, other than how to market and sell Toyota products, are made in Japan. The flow of information, particularly on safety matters, is one-way, from the California headquarters of Toyota Motor Sales, U.S.A., to corporate headquarters in Japan. Lentz conceded that his corporate superiors didn’t share information about global recalls with him — or, for that matter, with the National Highway Traffic Safety Administration. And that leaves the door open to potentially serious problems. The automaker has received a subpoena from U.S. District Court, which has empowered a grand jury criminal investigation, along with another subpoena from the Securities and Exchange Commission, which is looking into possible disclosure issues and securities fraud. While most of the action this week is taking place on Capitol Hill, the problems for Toyota seem to be coming from every angle. A new report, released Wednesday, provides still more reason for concern. The 2010 Customer Service Index, compiled by quality gurus J.D. Power and Associates, notes that the Toyota brand ranked well below average in terms of how its dealers handle customers. With those dealers reportedly racing to fix as many as 50,000 recalled vehicles daily, that could be a significant source of friction. For some nervous motorists, it will take weeks to get a service appointment scheduled. To drive away angry — and uncertain the fix will work — is not a recipe for renewed loyalty. If Toyoda truly believes that the company his grandfather founded has grown too fast for itself, he may have that problem solved for him. Toyota owners are, in fact, among the industry’s most loyal, but the steady drumbeat of bad news, compounded by lingering concerns about the safety of its vehicles, will likely stall the company’s momentum. Whether it can ever rebuild its tattered image and regain the trust of the public can’t be answered after two days of testimony.